“The right-wing has failed, change the government”. This is the title of the demonstration which I will be attending this coming Saturday night at 8pm in Rabin Square, Tel Aviv. 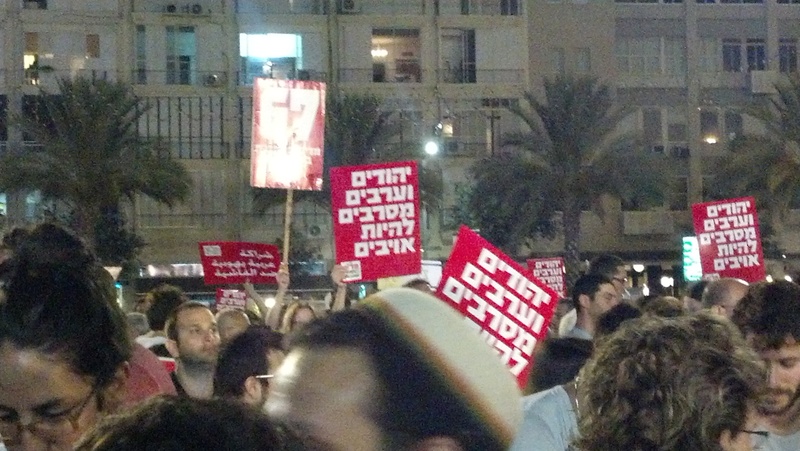 The previous demonstration which I attended in Tel Aviv, 3 weeks ago. “The right-wing has failed to bring the Israeli public peace or security…. It has failed in the negotiations with the PLO.” These are just some of the stated reasons why the organizers of this demonstration are calling for the current Israeli government to step down. Yes, Hamas did lose the recent war. But what hope do we have for the future when our current government seems to have put its pro-settlement ideology above so many other issues in this country? We have poverty, we have lack of housing, our classrooms are crowded, the world is about to boycott us. And Netanyahu’s answer: infuriating the world by expanding settlements in the West Bank! The current government in Israel is champion in making enemies. Its punishing the West Bank Palestinians when they have done nothing wrong. The 3 Israeli teenagers were killed by less than five extremists. By punishing all West Bank Palestinian with settlement expansions, our government will be turning so many people into our enemies. By expanding the settlements in the West Bank, the Netanyahu government is telling the Palestinians, “we don’t care whether you take part in a war against us like in Gaza, or you maintain peace with us (West Bank). We will collectively punish you regardless. I love my country. I care for its future. So why should I stay silent? Would you stay silent if your government was creating more enemies than jobs? If you are in Tel Aviv and you want to speak up, join us this Saturday evening. Here are the details.